Day 3 of #apeweek and we are looking at the largest tree-living animal on the planet. 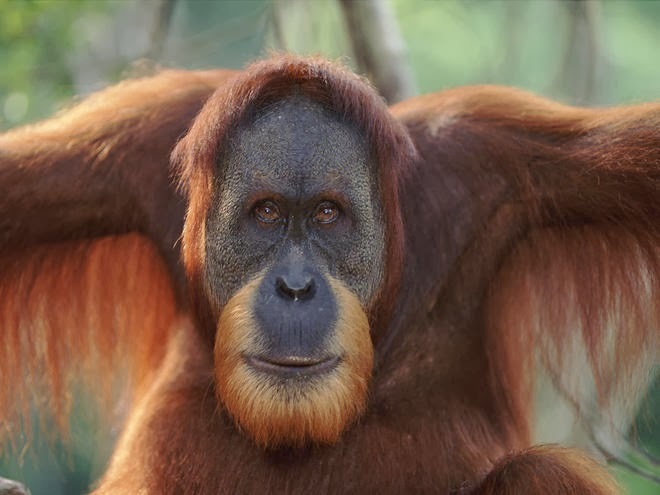 Known as the 'people of the forest' of course it is the one and only Orangutan. 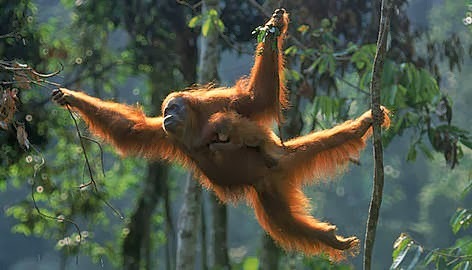 How can you not love the Orangutan, they are this gorgeous orange colour and move so majestically through the trees. The males develop those extraordinary cheek pads, to the extent that early Europeans actually thought they were a different species to the females. Males can weigh up to 90kgs, which is twice what a female can weigh. This makes them living in trees even more impressive. 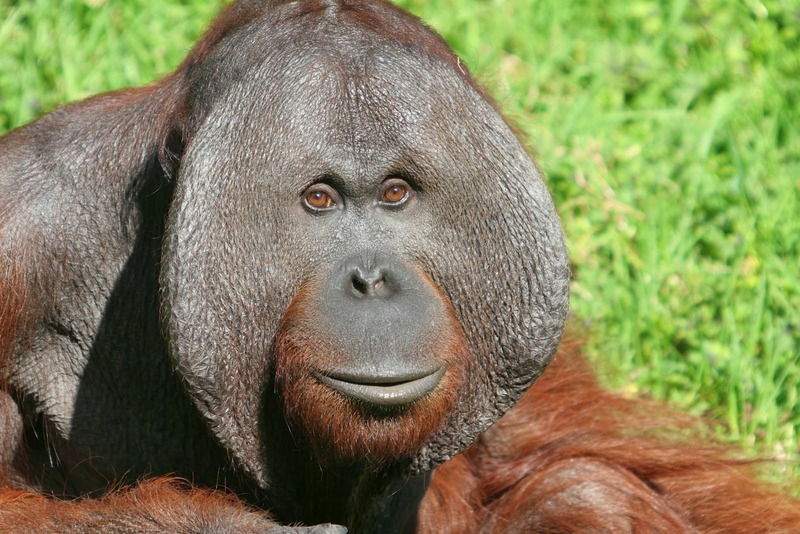 Orangutans only live in either Borneo or Sumatra and indeed these two areas have created two separate species. Actually, they are not that different, however, Sumatran Orangutans have a slightly lighter colouration and a more slender build. They also show more hair on the face and, in males, flatter cheek pads. Their Diet is similar both eating fruit, leaves, bark, flowers, birds' eggs, honey and various small vertebrates. Gestation period is over 8 months, sexual maturity in males 9.5 years and females 7 years. Their life span can be up to 60 years and the young stay with their mothers for years. Although Chimpanzees are the most famous for using tools, it is the Orangutan that is known for regularly making and using tools to extract honey or termites from inside tree trunks. They actually strip the leaves of a chosen stick and shorten it to about 30cm, fray the ends and then stick it into a bee hive and reap the rewards. 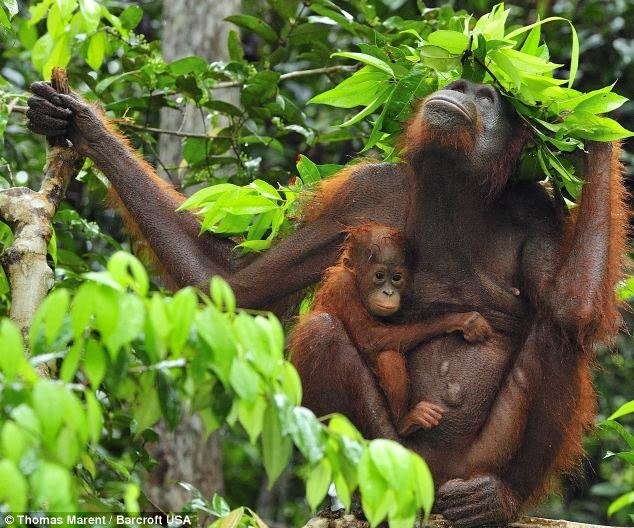 This behaviour has only been noted with the Sumatran Orangutan, but both species have been seen using large leaves as umbrellas. 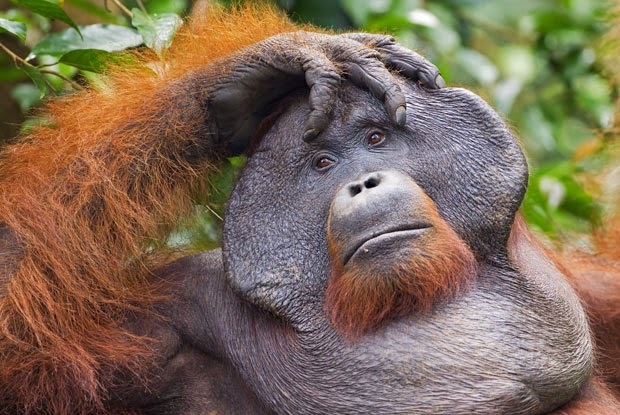 Palm Oil - easily the number one threat to the plight of the Orangutan, and I could do an entire post just on this. Please please please do not buy products containing palm oil unless they are sourced from a certificated sustainable source; like the RSPO. Palm oil is on average 10 times more productive than soya, which means it is not going away. So the answer is sustainable plam oil? Logging - legal and illegal logging is reducing the natural habitat of the Orangutans therefore creating less space for them to live. 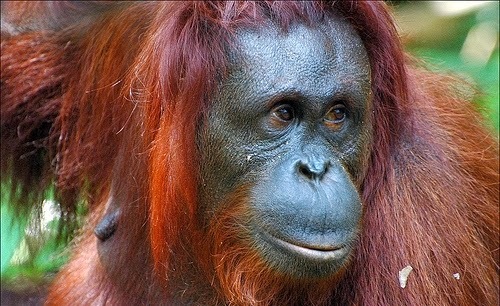 Orangutans have home ranges of 1-5 sq km. Pet Trade - Although illegal hundreds of baby Orangutans are taken from the wild and put into the pet trade; usually killing the mother in the process. As do all primates, Orangutans make extremely bad pets and it doesn't take long before the owners realise this and hand them over to a sanctuary. This leads to a life of captivity rather than being in the wild. Poaching - killed for food or to use bones to make souvenirs. Everyone needs a good Vegucation! A window into the life of a young Chimpanzee. My 2013 blog round up & get ready for #apeweek.